Experienced tax attorney at The Law Office of Tony Ramos, P.C. 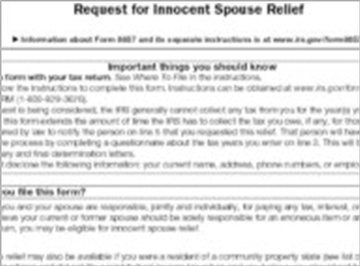 helps you qualify for the IRS Innocent Spouse Relief program. Innocent Spouse Relief, which can unburden you from paying because of a spouse's tax misdeeds. Separation of Liability Relief, which allocates taxes owed for which you are responsible for with a former or current spouse because of improper reporting. Equitable Relief when you do not qualify for the above but the amount reported was correct on your joint return. To learn more about your options and discuss your individual circumstances, call our San Antonio tax debt relief attorney at (210) 981-5716 today. You must meet a few conditions to qualify for the IRS’s relief program. This includes requesting Innocent Spouse Relief no later than two years from when the IRS first attempted to collect, you filed a joint return with a deficiency or error attributed to your spouse, you swear that you did not know of this error, and you prove that it would be unfair to hold you accountable for the penalties of the debt. To learn if you qualify, contact our tax debt relief lawyer in San Antonio for a free initial consultation. Whatever you are facing, taking quick action is essential. Let The Law Office of Tony Ramos, P.C. assist you. We understand just how stressful it can be both personally and professionally to face an additional tax burden that you are not responsible for. The IRS often has a false view of what financial assets you have, such as those which you do not personally control or those not available for repayment. We can work with you to ensure that the IRS has a clear view of what you really owe and what assets can actually be used to pay them back. Our firm has earned a positive reputation for our dedication to our clients and our accessibility.